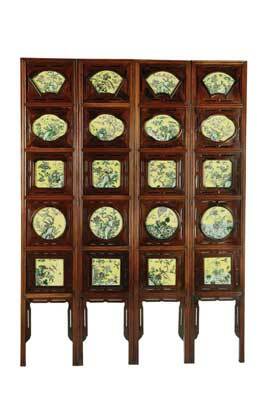 This unusual famille jaune porcelain-inlaid four-leaf hardwood screen, recently sold at Bonhams for Â£22,500. Looking at this spectacular piece, you will see that each leaf is inlaid with five porcelain panels in a vertical column. The top piece is fan-shaped, the next lobed, the third a lobed square, the fourth circular and the last a straight-sided square. One circular panel with a qilin prancing over waves and breathing out a wisp supports two bundles of books, and another two panels depict two cranes wading amidst lotus and another crane in flight above. The remaining panels are variously enamelled with birds perching on floral branches issuing from rockwork, all set within reticulated wooden borders. The yellow ground porcelain contrasts well against the dark hardwood and is of a high quality. The Chinese valued symmetry and order as can be seen in the overall layout, but the individual subjects of the panels are naturalistic and asymmetrical. This is typical of the paradox of Chinese art. The qilin or mythical Chinese unicorn, with the body of a horse or deer, is a symbol of serenity and respects all plants by not eating living vegetation. Its part in bringing books is a reference to the respect in which scholars were held in Classical times. There is another hidden reference in this piece to the Classical age: the number five. There are five plaques in each leaf. In Chinese philosophy there are five elements â€“ Wood, Fire, Earth, Metal and Water. There are also five Precepts in Buddhist teaching, so you could say this is just a pretty screen or you could say that it is a reference to some of the oldest cultural and religious teaching in the Orient.